Your Top Three is a series where we choose a topic and you give us your top three picks. Fans are still upset about Ben Affleck being cast as Batman in the Man of Steel sequel (maybe titled Batman vs. Superman). Could this go on for the next year and a half, until the movie actually hits theaters? It just might, but that's a long time and in that time a lot of the naysayers could catch up with some Affleck performances that change their mind. I don't just mean the films on his production slate that we haven't yet seen (such as Runner Runner and the Gone Girl adaptation). I mean his past gigs that maybe aren't being considered because reputations of stuff like his 2003 trio of Daredevil, Gigli and Paycheck are clouding everyone's judgment. No, Affleck is not an amazing actor. He's often perfect for his part, though. I don't think he necessarily shows award-worthy talent in Dazed and Confused, Pearl Harbor, The Sum of All Fears or even his recent Best Picture winner Argo. But he does the job sufficiently in every one. There's never a case where Affleck's performance is worse than the movie he's in, which indicates that the times he comes off downright awful it's probably the director's fault. And outside of quality of his acting craft, if you simply don't like his face or his style or his tone, well that's probably just on you. Maybe sometimes on Kevin Smith, but mostly probably on you. Let's just not say that Affleck is a bad actor. He's not. He's been doing it for a long time, since he was a kid on the wonderful Voyage of the Mimi show, and even if he doesn't always go the super-serious performance route, he knows what he's doing in front of a camera -- even as much as he does behind it, as the one has informed the other, and perhaps he just takes directing more sincerely because it's a rarer thing. I can't agree that he deserved acting awards from Blockbuster for Forces of Nature, Bounce and Armageddon, and I haven't seen his Golden Globe-nominated stint in Hollywoodland or his Emmy-nominated role as a steroid-using football player on an episode of Lifestories. Maybe I believe he earned that Razzie Worst Actor dishonor for his 2003 triple threat if not his nomination for Worst Actor of the 2010s. But I think he's pretty good in a bunch of films, my favorites of which are below. 1. Good Will Hunting (as Chuckie Sullivan) - He's a bit of a caricature, but a pretty good one. And he never holds the movie down given that he's working with stronger talents like his buddy Matt Damon, his brother Casey and Robin Williams. His "best part of my day" speech and job interview scenes in particular are as well acted as they need to be. 2. Boiler Room (as Jim Young) - Obviously influenced by Al Pacino's part in Glengarry Glen Ross, his monologue scene in Ben Younger's chop shop drama was his true first standout movie-stealing performance, and it's still pretty terrific even if it's a pretty small part. He had some Best Supporting Actor buzz for a bit with this, but not all performances are about awards or realism or drama. They're to be remembered, and he's always been the most memorable thing about Boiler Room. 3. The Town (as Doug MacRay) - Maybe it's because I think of his role here as being an older version of his Good Will Hunting character (his relationship with Jeremy Renner's character is somewhat reminiscent of his relationship with Matt Damon's). Maybe it's that he not only knows how to direct other greater actors but he knows how to show his own strengths. Both are good enough for me. 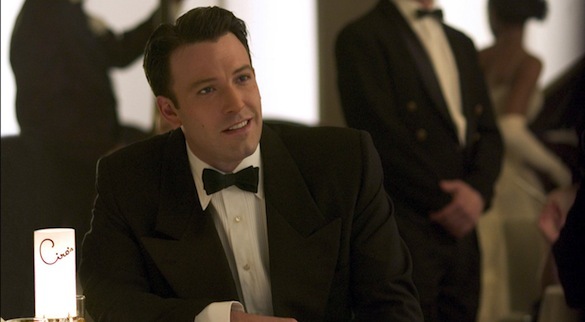 The Town, Chasing Amy, Dogma “@thefilmcynic: POLL: What are your top 3 Ben Affleck performances? @thefilmcynic DOGMA, BOILER ROOM and JERSEY GIRL. @thefilmcynic Changing Lanes, Hollywoodland, The Company Men. @thefilmcynic I actually have two: CHASING AMY and DOGMA.